Spring 2011 is upon us and with it wild and cultivated herbs, flowers, trees and hibernating seed spirits of all kinds are beginning to awaken beneath the ground, preparing to break through soil and greet the world above. The YAMUNA river, now clear of ice, is flowing free and swift, melodiously gurgling "spring is coming," to the tune of rock and root. Yesterday, I saw a small patch of squat bushy mint protruding from the base of a rock near the greenhouse and a sweet buzzing bee landed on my gardening glove. Ah!! Spring so gentle and kind, full of REBIRTH and GROWTH and PROJECTS, PROJECTS, PROJECTS!!! There are so many exciting projects under way here at Gita Nagari Yoga Farm; one's head might spin when thinking of where to begin... but as we say around here, "Let's talk about, let's plan it, let's do it." The GIFT SHOP, now in its final stages, is being painted and soon after items will be brought in. The old school house has been cleared, is now being fastidiously cleaned, will undergo necessary renovations, and will then be rebirthed as a YOGA STUDIO and MEETING VENUE. The backpacker’s cabin looks great and is in its final stages of construction. These three (3) projects will be completed in May in time for retreat and festival season. 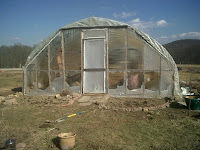 The greenhouse is being cleared and prepped for spring. The surrounding herb gardens have been flipped and new green growth is already peeping through soil. Debris from winter storms is being cleared throughout the property. The kitchen has been reorganized to maximize space and efficiency. Check back later this week for more updates and lots of pictures.